Aberdeen is set to �Play the Night� as Scotland�s biggest urban light festival returns to the city for fifth year. The award-winning SPECTRA returns to the city from 8-11 February, entertaining audiences whilst celebrating the 2018 Year of Young People. Organised by Aberdeen City Council in partnership with Curated Place, SPECTRA will once again light up the winter nights offering more experiences of light and sound than ever before. 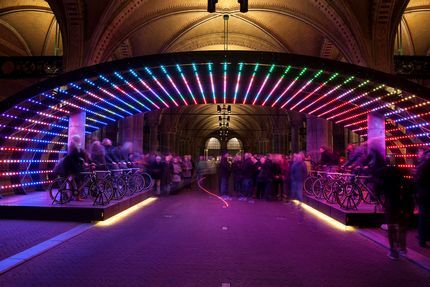 From the 8-11 February SPECTRA will encourage audiences to get out and experience the city at its best when interactive sculptures, architectural projections and experimental music which will create new ways of exploring the city. A host of international and local artists are producing work, including Vivendimultiplex who will create an amazing light playground in Union Terrace Gardens with their competitive bicycle installation �Lightbattle�. SPECTRA favourites Paul Friedlander and Impossible will also return with new installations. Digital artist Seb Lee-Delisle returns to take centre-stage in Marischal College Quad alongside graffiti artist and master of photographic light-painting SOLA, while Stanza�s �The Reader� diligently reads every book published since 1958. In the Kirk of St Nicholas, the sun and the moon come together as Icelandic musician Halld�r Eldj�rn exhibits �Poco Apollo�, while David Henckel�s �The Sun at Night� will bring a year in the life of our own star to Aberdeen. Both installations will feature live performances throughout the festival. Meanwhile, Granite Noir are supporting new work at street level. Projection specialists Illuminos will light up the facade of His Majesty�s Theatre with the rediscovered �Song of Shetland�, whilst Felix�s Machines returns to SPECTRA at the Anatomy Rooms for an amazing live show with electronic pioneers Plaid. Music venues across the city will be brought to life by a smorgasbord of Nordic and UK talent with late night sessions with some of Europe�s top DJ�s as they launch their new music programme next week. Their two-day Catalyst Conference also returns on 9-10 February and will bring together successful cultural leaders, artists and experts from across Europe and within the UK, to present their strategy around cultural development in Aberdeen. SPECTRA 2018 will once again be an exciting event for all, which will shine a light on our beautiful city in the depths of winter. SPECTRA is coming into its fifth year and really highlights Aberdeen as a cultural hub of the North-east. The festival is constantly evolving and this year is no exception as we are excited to introduce our new music programme next week. As part of our Aberdeen Events 365 Strategy through our City Centre Masterplan, Aberdeen City Council is committed to making our city an even more vibrant place to live, work and visit � and SPECTRA encourages people into the city centre at a quieter time of year, boosting the local economy and reactivating city centre spaces. For Spectra 2018 we�re aiming to massively up the ante on the festival experience by introducing a spectacular music programme alongside incredible artworks from around the world. Our close partnership with Aberdeen City Council has enabled us to develop an ambitious, effective and close-knit team across the two organisations whose enthusiasm allows us to deliver an event that is helping to expand horizons for the city and the possibilities for major cultural events in the North-east. 2018 will also see us expand the festival into a major conference bringing the best cultural leaders from Europe, inspiring speakers and some of the most amazing visual and sonic artists together to explore cultural leadership on the edge.